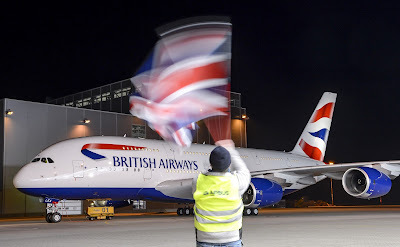 Airbus A380 British Airways will launch to serve London Heathrow - Frankfurt, Germany route do start from August 04, 2013, operating 1 round-trip service. 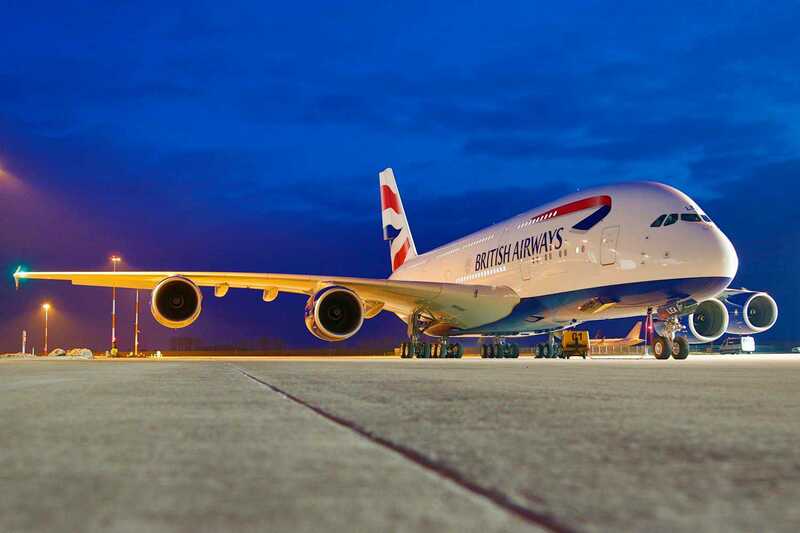 BA will be conducting a serious of A380 training flights on existing short-haul routes in August and September 2013. Last-minute aircraft change to A380, and vice versa, is highly possible. Airbus A380 British Airways will launch to serve London Heathrow - Johannesburg, South Africa route do start from February 12, 2014, replacing Boeing 747-400. The oneWorld member operates 17 weekly service on this route, just 3 time a week will serve by Airbus A380, the rest will be served by Boeing 747-400. London - British Airways has issued this statement about the delivery of its first Airbus A380. First New Airbus A380 British Airways arrives at Heathrow, UK today. British Airways is the first airline from UK which will operate the double-decker Airbus A380 largest commercial jet in the world’s. 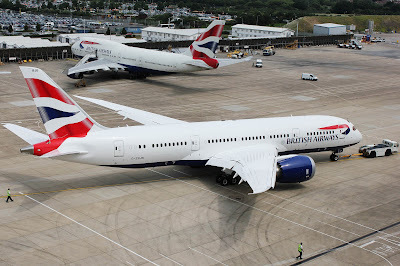 On last week Boeing 787 Dreamliner British Airways already landed at Heathrow, so British Airways is also the first airline in Europe who have the Airbus A380 and the Boeing 787 Dreamliner on their fleet. New Airbus A380 British Airways will serve first long-haul flight to Los Angeles on September 24, 2013, prices starting from £621 return, and the first to Hong Kong on October 22, prices from £688 return. Today at June, 27 2013 Boeing and British Airways announced the delivery of the UK carrier’s first Boeing 787 Dreamliner. The British Airways Boeing 787-8 departed Paine Field in Everett, Washington, on Wednesday, June 26, arriving at London’s Heathrow Airport today at 12:10 pm local time. 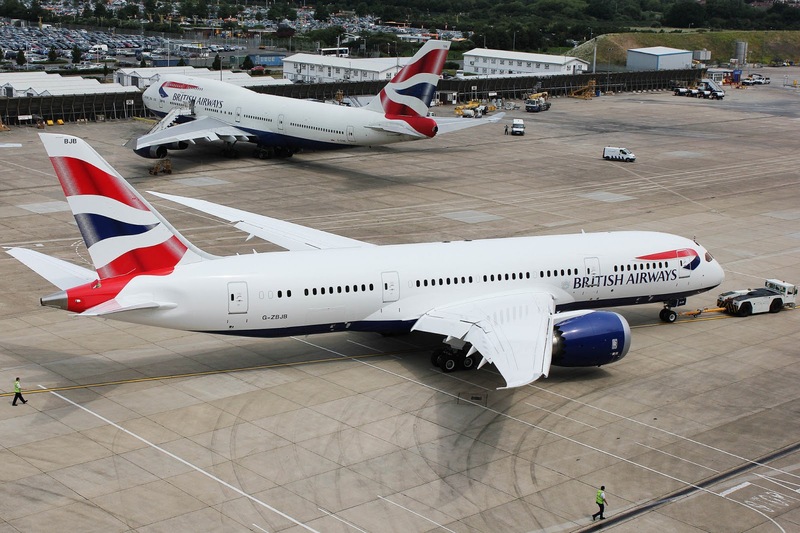 The airplane was welcomed to its Heathrow home by Willie Walsh, chief executive officer ofInternational Airlines Group (IAG), the company that owns British Airways. 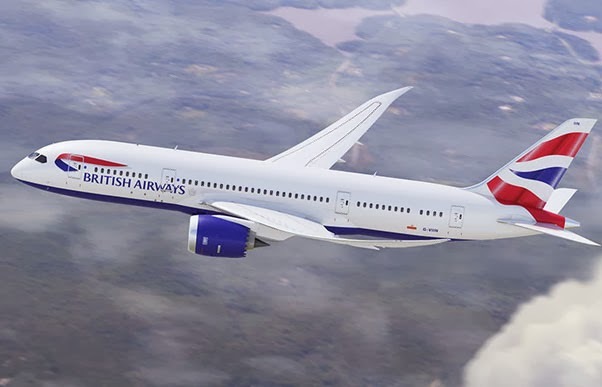 British Airways has announced that the airline will operate the 787 from Heathrow to Toronto from September 1 and Heathrow to Newark from October 1. 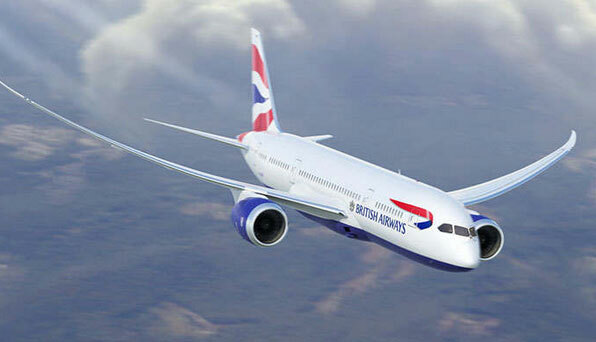 British Airways has ordered 24 787s, which will arrive over the next four years. The airline has also ordered 12 A380s and six additional Boeing 777-300 ERs. Over the next 12 months, it will take delivery of a new aircraft at the rate of one a fortnight.